Stay and play at The Village Hotel near Main St. and the lifts.The Village Hotel offers the perfect combination of location convenience selection and value. Centrally located at the base of Breckenridge Ski Resort the hotel is in the Village at Breckenridge complex just steps from historic Main Street and its many dining and shopping options. 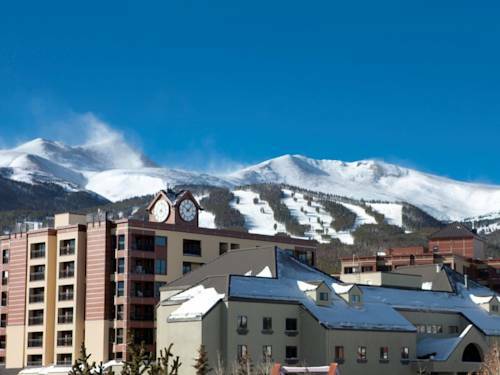 In the winter enjoy the world-renowned skiing near the Town of Breckenridge and discover what it is about the Village Hotel that has skiers and snowboarders returning year after year. Easy access to 30 lifts serving over 150 trails make the Village Hotel one of the most convenient places to stay on your Colorado ski vacation.During the summer months explore the areas many scenic mountain trails on foot or bicycle and experience the extraordinary beauty of the Rocky Mountains. Whether you prefer the thrill of skiing world-class terrain or simply soaking up the Colorado sunshine the Village Hotel has a little something for everyone. The hotel offers ghost tours, and the gift shop sells keys to room 217. Stephen King stayed here and later wrote "The Shining." Appeared in the TV miniseries.